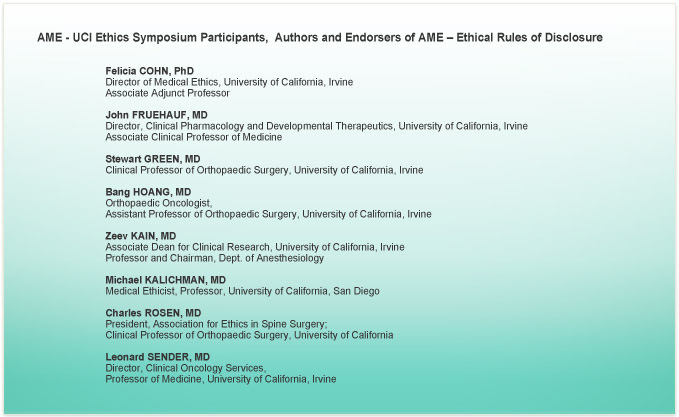 A symposium was held on June on 27, 2008 at the University of California, Irvine School of Medicine, co-sponsored by the Association for Ethics in Spine Surgery, for the purpose of addressing a perceived lack of disclosure in medicine. Specifically, the symposium addressed the precise amounts of money being given by medical companies to the physicians who are influencing medicine with their research and opinions. 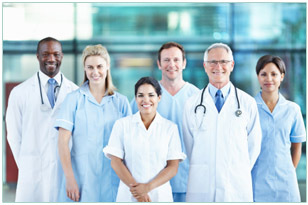 In addition, those holding certain positions in medicine should be expected to have limited or no financial interests. Explicit transparency is sorely lacking and strongly warranted for the sake of patient care, which should be held as the highest single priority. As a result of the symposium, a group of like-minded physicians created the Association for Medical Ethics along with a set of rules to address these deficiencies. Good medicine and science depend on minimizing bias. Financial ties and financial incentives present compelling interests that may result in unintentional bias and potentially intentional bias. Even where financial conflicts do not result in bias, the integrity of science and medicine is at risk because of the potential perception that bias may have occurred. Because of the risks of real or perceived bias, transparency regarding financial interests is critical for clinicians, scientists, and the public to weigh the validity of research findings, policy decisions, and practice guidelines developed by professional medical societies. Academicians with or without tenure, editorial board members, and medical society officers are looked to by the public, academics, and fellow physicians as a source of unbiased scientific data and education. Therefore, they should have no Substantive Financial Interest (defined below) that creates unacceptable conflicts. All scientists and clinicians should publicly disclose in all publications and presentations the precise nature and amount of any financial conflicting interest exceeding $500 per calendar year. Financial Interests: Financial interests consist of anything of monetary value, including but not limited to, salary or other payments for services (e.g., consulting fees or honoraria); equity interests (e.g., stocks, stock options or other ownership interests); and intellectual property rights (e.g., patents, copyrights and royalties from such rights) received within the preceding three calendar years. Substantive Financial Interest: Although any amount of money may induce bias, a “substantive financial interest” will be considered an amount that most reasonable persons would regard as unequivocally creating a significant risk of bias. Various existing guidelines set differing thresholds, but “substantive financial interest” will be defined here to be the direct or indirect (e.g., via a foundation) 	receipt from industry of greater than $50,000 in personal compensation in any form. Incomplete Disclosure: Negligence in reporting disclosures exceeding current market value of greater than $10,000 for any of the preceding three calendar years. Academicians: Physician or academic authors of papers who present or publish evaluations of product for clinical implantation or procedural use. Program insert for presented papers. Title page footnote for published papers. Medical society website for medical society officers. Loss of academic appointment whether tenured or not. Suspension of editorial board activity. Medical society officer impeachment . Compliance with AME – UCI Ethical Rules of Disclosure will warrant recognition by AME as meeting the highest standards of unbiased medical ethics, education and research, and as such, be valued publicly in their opinions and policy. Such recognition of compliance will apply to medical societies, peer-reviewed publications, medical and scientific meetings, papers and presentations. AME will function as watchdog group. Alleged violations will be investigated, and, if accurate, reported on AME website and reported to appropriate society or publication. Salaried faculty, with or without tenure, doing publishable clinical research should eliminate substantive personal financial interests, if present, prior to engaging in such research. Grants from industry may be directed, but should be unrestricted and departmental. Non-salaried faculty should not represent published clinical research as university-based if substantive financial interests are present. Editorial board members should eliminate substantive financial interests, if present, prior to serving on the board, by divestiture. Officers should eliminate substantive financial interests if present, prior to taking office, by divestiture. Disclosures using guidelines as noted above for three preceding calendar years should be made available on society website. No arrangements or financial transactions during their term of appointment that involve delayed future compensation should occur. This includes the sale or purchase of the stock, in any form, of a company involved in medical care unless part of a regulated mutual fund.